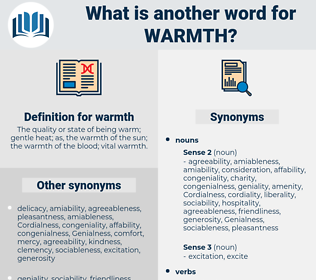 What is another word for warmth? The quality or state of being warm; gentle heat; as, the warmth of the sun; the warmth of the blood; vital warmth. sympathy, warming, excitement, temperature, passion, fervor, hospitality. 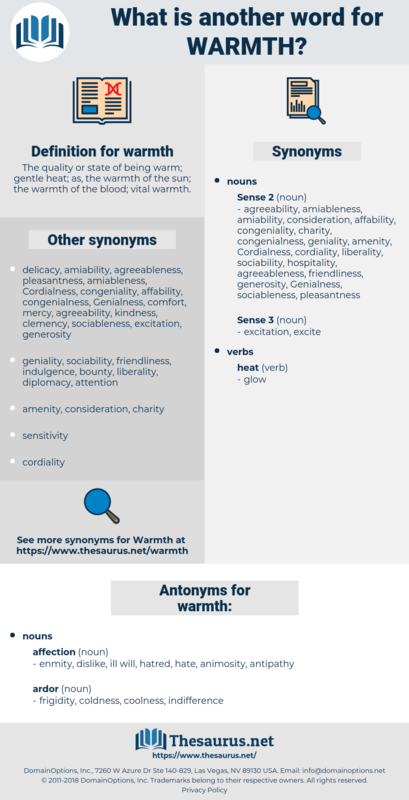 heats, cordiality, friendliness, enthusiasm, affection, thaw, tenderness, heating, warmest, heat, conviviality, warm. enmity, dislike, ill will, hatred, hate, animosity, antipathy. distress, irritation, botheration, torture, exasperation, annoyance, torment, bother, aggravation. frost, Insensibleness, calculation, dryness, composure, reserve, impassiveness, Woodenness, deadness, insensitivity, reticence, policy, stiffness, insensitiveness, dulness, caution, timidity, lukewarmness, chill, frostiness, impassivity, taciturnity, wariness, iciness, phlegm, calmness, Collectedness, cold, stoicism, Frigidness, reservedness, prudence. Albert spoke with some warmth. Better than any man of any time he was able to enter into the heart of a boy, to view things with a boy's eyes, and to write of them in simple verse, touched with the warmth and color of his rich imagination.